I would like to use the psychopy backend but it generates an issue concerning the way mouse responses are initiated apparently. Ideally when I collect responses with the mouse I would like the cursor to be centered in the middle of the screen. If I use expyriment as a backend the initial position of the mouse is always at the center of the screen for both responses. However if I use psychopy as a backend apparently the position of the mouse is initiated at the center for the first mouse response, but then for some reason it is initiated at the position of the click ( collected during the first mouse response) on the second one. Would there be a way to set the initial position at the center for the second response by using psychopy? Hey I answer to myself. Apparently if there are multiple mouse responses in a a sequence, I guess that the variable associated to mouse responses are not reset. For instance if I run something like this, three sketchpad, each of them waiting for a mouse click, the first one is waiting for this click but not the other two (they just pass without waiting for the click). The only solution I found to avoid this is creating a ghost mouse object with a timeout of 0 between slide. Then yeah it is working, i.e. it waits for clicks as it should between sketchpad and reset mouse position. It is only happening with psychopy backend, with expyriment this issue is not present (I run version 3.2.4 on windows). 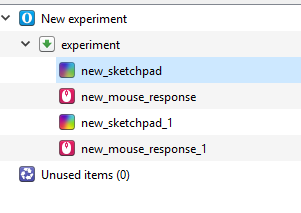 Could you also just use a mouse_response item rather than an inline_script in between the sketchpads? This sounds like a bug though, would you mind opening an issue on github? Sorry for the delay I have been a little bit busy lately. If I use a mouse_response item rather than an inline_script then it waits for the mouseclick at every item, but the position of the mouse is not reseted at the center of the screen. Yes I could open an issue on github will try to do it this week (I do not have a github account).